August | 2013 | He Cares! I started getting the nudging in my soul to sign up, but I really didn’t want to. You see, I’m not physically fit–quite the opposite, in fact. I need to lose over 100 lbs, have a desk job, and walking for 15 minutes at a time, or up a flight of stairs was challenging for me, but that nudging just wouldn’t STOP! So, I talked to the organizer and signed up. The first meeting I was out of town, so I didn’t go, and I tried to find every excuse possible to not go to the second meeting, but…that nudging was still there, and I was convicted to go. I knew that I could hang with the Bible study part of plan, so there I was. Walking into that Bible study really changed my perspective. The leader had personally lost 90 pounds, so he understands my battle, and had very enlightening commentary, not to mention that he and his wife and children provide a wonderful example of a Christian family. Every week at least one member of the group would hang back with me, and walk our work out portion of the class rather than run their own race, to make sure that I knew I was part of the group. The 5k was yesterday (August 17th). It was a wonderful experience for me. I didn’t sleep much Friday night. I was very nervous and filled with many questions–Would I be able to finish? What would the runners not with our group think about this out of shape walker? Then, I don’t care–I’m doing this for God and to prove to myself that I can do it. The self doubt and correction continued until I cranked up the praise songs on the way to the race. God gave me a peace about the event. I just wanted to finish, and it would be wonderful if I didn’t finish dead last. Our group met as a team and prayed before the event. Prior to meeting up with my group I had the opportunity to talk to several runners, all of who were very nice and supportive. Then we were off. The course did have quite a few hills, but it was an out and back course which proved very good for me. I was the only one on our team walking the event, so the other members on my team that were running would yell encouragement and claps at me as they passed! It was SO encouraging, and inevitably came at just the moment that I needed it to keep going. The runners that I had met before the race also offered encouragement as they passed! Then, when I had probably 1/2 mile to go I saw our leader running toward me. He joined me in my race, and walked with me, talking to me, and offering encouragement. I get teary eyed just thinking about what happened next–as I started to round the bend for the finish line–there they were–ALL of the Run for God team members. They joined me for the last section of the race, encouraging me, and letting me know that they are proud of me. They dropped off just at the end to let me cross the finish line on my own. I completed my first 5k in just under 57 minutes! AND…I was not the last one to finish the race, though by the end of the race–I really wasn’t concerned about that anymore! The picture above is of our team just after the race. I am the one in the maroon shirt on the right side of the picture. 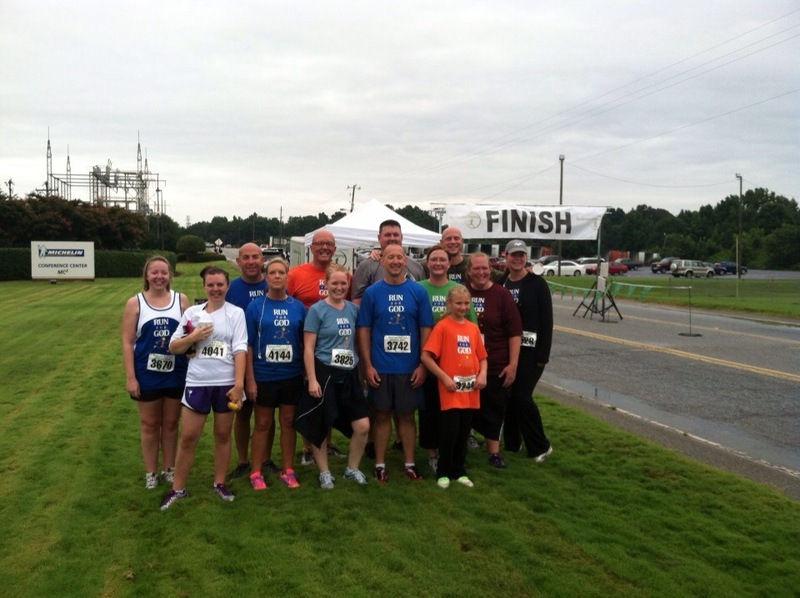 A HUGE thank you to all of the members of my Run for God team. Each of you holds a special place in my heart! To all of you who doubt if you can do something–take a chance–you may be very surprised, as I was, at what is waiting for you to experience! The current Bible Study that I’m doing is “What Happens When Women Say Yes to God” by Lysa TerKeurst. In Chapter 2 Lysa provides the following questions as a starting point to discerning if what you are hearing is God’s voice. Before I proceed, I want to make it clear that the analysis that I am doing in this blog post is not intended as advice for anyone else as the decision was made based on my individual circumstances. I want to share my story, in hopes of helping someone else that may be in a similar situation but realize that I don’t know that outcome of what I feel that I have heard from God. I have a peace in the decision that I have made. I have been having marital difficulties for a very long time now, and have been earnestly praying for God’s will to be done in my marriage for a very long time. My husband has an issue with alcohol, and the issue has not been improving, In fact, it’s gotten much worse over the past few months, much to my dismay. The atmosphere in our home was very tense–with us walking on egg shells around one another, and we’ve been living separate lives for over a year now. On the weekends he would go out drinking with friends, or have them over at the house, and my daughter and I would do our own thing like go to a park, movie, zoo, etc. Communication was minimal at best, and the closeness and friendship that my husband and I once shared has disappeared. I had talked to my husband about my feelings, with no response or results. After a particularly bad evening I determined that it would be best for us to separate, in hopes that my husband will admit he has a problem and take action. I also realize that I have healing that must take place, so I will be focused on myself and our daughter during this time. It is my hope in time, we will be able to have a God centered marriage, where all parties are benefiting one another and not hurting each other. I have been VERY conflicted with this decision, so I decided to put the decision to the test as to whether or not what I thought was God’s voice was. 1. Does what I’m hearing line up with Scripture? Confirmation comes for me in 1 Corinthians 7:11 that if a wife separates from her husband, she should either remain single or be reconciled to him. It is my prayer that my husband and I will be able to reconcile after the alcoholism issue is addressed. Also, God’s word tells me that I should not associate with anyone who is among a list of things, abusive or a drunkard. 1 Corinthians 7 10 But for those who are married, I have a command that comes not from me, but from the Lord. A wife must not leave her husband. 11 But if she does leave him, let her remain single or else be reconciled to him. And the husband must not leave his wife. 1 Corinthians 5:11 I meant that you are not to associate with anyone who claims to be a believer yet indulges in sexual sin, or is greedy, or worships idols, or is abusive, or is a drunkard, or cheats people. Don’t even eat with such people. 2. Is it consistent with God’s character? My living situation has not had those attributes for a long time now, and I feel that God really wants us to be able to experience his peace, especially in our home. 3. Is it being confirmed through messages I’m hearing at church or studying in my quiet time? Yes–I’ve actually felt that we needed to separate for a time for several months now, and had brought up the idea several times. Honestly, had myself convinced that it was the devil trying to break up my marriage, but now, I feel that maybe a separation is needed so that God can work in my husband’s life without me interfering. God could have such greater plans for my marriage than I can even imagine! My preacher gave a sermon on Expecting Expansion. He asked us to ask ourselves what we are expecting because that is what we’ll get. He also asked us to survey our territory, and if we have unfinished business where we’re at to get it right. God is much more about changing our insight than in changing our surroundings. Another article that I read defined leaving a marital relationship explained in 1 Cor 7:12-16 as one partner breaching the boundaries of a Godly relationship. I also listened to a book by James Dobson “Love Must Be Tough” and the decision to separate for the time being is one example of tough love that Dr Dobson explains in the book. Goodness, YES! There is NO way that I could have ever made this huge decision on my own, and absolutely no way that I would be able to get out of the bed each morning of my own accord while going through this. My husband is the love of my life-still! It pains me greatly to know that he is going through a tough time, and for me to be able to do this is completely a God thing. Phillipians 4:13 For I can do everything through Christ, who gives me strength. I think in my specific situation, it would please God. He knows my heart, and knows that I am sincerely praying for healing and reconciliation, but at this time for the safety of myself and my daughter, it is best for my husband to live elsewhere. I know that God wants me to be happy in Him, and wants to give me a peace that only can come from Him. I also feel that maybe God has great plans for my husband. I pray daily for my husband to want to know God more, and that I will continue to thirst for and seek God daily. Please know that I am not perfect, and that I have not always responded as I should have to my husband. I will be completely honest and admit that I contributed to issues in our home through enabling the drinking and not communicating at the onset of problems that arose in the home. My husband is a good man who has a problem and needs help. It is not about what has happened, but about what can happen through God!